10 minutes before Shabbos was over the sound of sirens filled the air, and fire trucks were seen rushing from all directions to the scene of a massive fire on Brooklyn Ave. and Rutland Rd. 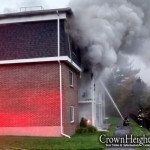 what started out as a smoke condition quickly turned into a Mayday then a Second Alarm Then immediately a Third Alarm. A fire fighter that was inside checking out the smoke condition got trapped on the second floor and called a Mayday and was then forced to jump, being as high that it was, they positioned the bucket ladder and the fire fighter jumped into it getting lightly injured, numerous other firefighters were injured from smoke inhalation. The fire was particularly hard to put out, due to the fact that it was so badly embedded in the building, time and time again the fire kept coming back from different parts. The fire lasted for over an hour. Well over 40 Fire Trucks and Ladders responded with even more Ambulances and Special Services Vehicles. wow, serious fire!! i saw the story on news channel 12. amazing coverage once again ben!! whom ever tookj these pictures, you’ve got some darn good stuff. beautiful pictures! who took them? what does this have to do with the jewish community in CH ??????????? who took these pics on shobbos? just outta sheer curiosity….how is it sooo dark10mins b4 shabbos??? 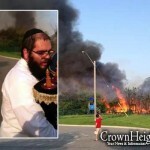 theres been alot of fires in crown heights lately!!!!! I hope you waited at least the ten minutes till Shabbos was over before you ran for your camera. Nice Pic’s Webby Keep Up The Good Work. First off I took these pictures and it was not on Shabbos! Second I must thank everyone for worrying about me and waiting till Shabbos was over, I am so happy to see so may peoples concern for me and my Shabbos times. Now if you really read the story you’ll see that the fire didn’t brake out, not until there were fire fighters in the building, the fire started at around 7:20pm, I got there pretty late actually it was already 7:40. It was just then that the fire began burning so bad, so I guess Hashgacha Pratis that I took my time after Shabbos with everything… got me all these good pictures. Now for all those of you who are ‘living in a bubble’ Crown Heights has moved down as far as Midwood (one block over from the scene of the fire) this is very much crown Heights as say New York and President. everyone is so funny worrying about webby taking pictures on shabbos, what do you think he is a goy? it says it started after shabbos. really HOT pictures!! keep it up!!! first of all that is crown heights, we personnaly live 2 blocks away from the fire sceene along with 15 other families who have just moved here a few months ago. 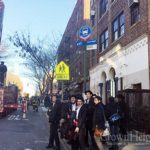 and the fire did not break out until after 20 minutes that shabbos was over so you had plenty of timw to say havdalla and daven maariv. for those of you who are worried about the photographer. why is it that people always have something bad to say right away. lesson in life" tracht gut vet zein gut"
Your story doesn’t say the fire trucks were racing to a smoke condition 10 minutes before Shabbos was over. It says they were racing to a "massive fire," which is what you took pictures of. While your explanation makes sense, and I think those who made comments about Shabbos figured as much, you might have chosen your words more carefully l’chatchila. All you loosers and nasty people with nothing nice to say BACK OFF 200 FEET. The fire started whenever… The first fire trucks could be heard on Empire Blvd during Marriv. After Marriv there were still more trucks flying down Brooklyn Ave. When the J.E.M. Rebbe Video finished at Empire Shteible 15 min after Marriv you could still see from Brooklyn Ave and Sterling Ave Flames shooting from the building. I too live on brooklyn ave. a couple of blocks away from this fire and it happened so near to end of shabbos that webby would have plenty of time to take pic’s. as he wrote it lasted for more than an hour and we watched most of it from our place. cool pictures thats forsure!